So I have been working on the Widowmakers, but last night I decided to switch gears. I forgot there is a hobby bonus for a fully painted battlegroup by the end of this week for the league. Since one of my warjacks is done and the other I’m still waiting on, I decided to at least try and get Kommander Strakhov done. I already had the scheme for the force in mind as you know, but how would I translate that to Strakhov? I didn’t want to go all willy-nilly and end up with an endproduct I didn’t like. 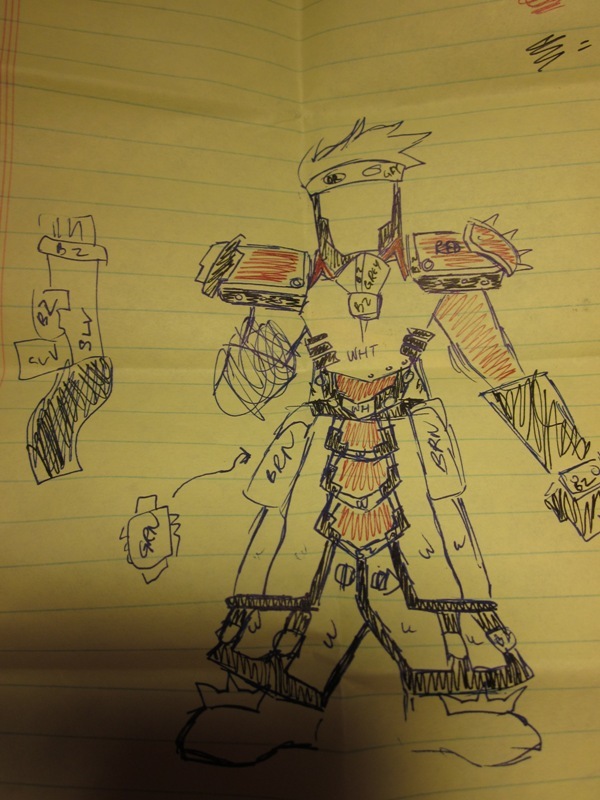 So I took advantage of a lull in my day at work and sketched out my planned scheme. That masterwork is below. Still working on her, but I just think she looks cool as is. She’s actually going to go on the side burner for a bit as I’ll be moving on to Strakhov shortly for the League. 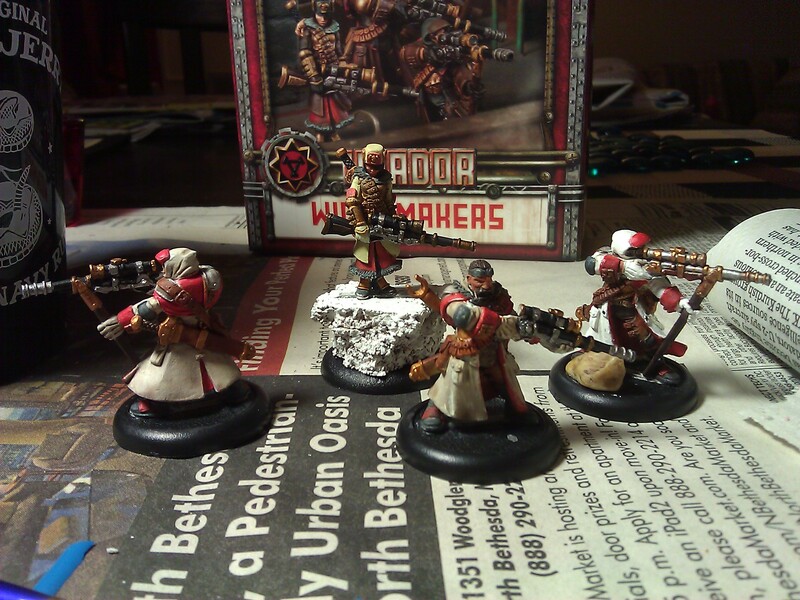 Another test post from my phone, this time with a picture taken on it, and showing what I’ve been working on today, the Khador Widowmakers! The leader sculpt is one of my favorite Khador sculpts and I thought it fitting for her to be standing over her enemies, surveying the landscape from up high, so she and the rest can then rain death to the Motherland’s enemies from a forest on a cliff’s edge. I took this picture while I was waiting for some washes to dry. There is still much highlighting to do and a few more layers (that’s why they look yellowish). I just got my hands on the cork today so I’m waiting for the primer to completely dry for 24 hours before I paint it. They are all waiting for my snow flock to come in so I can finish completely basing then. So tonight was the first night of our league and it was a great time. There are now about 22ish people signed up, with it being clearly 2 Warmachine players to every 1 Hordes player. We all managed to do a little bit of painting and a little bit of playing. I’m excited to finally get started (finally!) on the models I have and start posting them here. All in all, it was a great pair of games and Mike was very patient with me as I still nail down the details of playing. I’m really looking forward to the rest of the league and thanks again to the guys for their painting tips and help! Oh and sorry no pictures, I didn’t think primed or bare metal 9-11 point games with minimal terrain would be very interesting to look at. This is the first post made from my phone. Works pretty well. Holy crap I can’t wait! Hand Cannon Online has an unboxing of the 2 player battlebox coming out on Sept. 28th (the very one I ordered). The slow grow league is starting up this Saturday, and I believe there are around 15-17 players entered into it, spread out pretty evenly across the various factions. 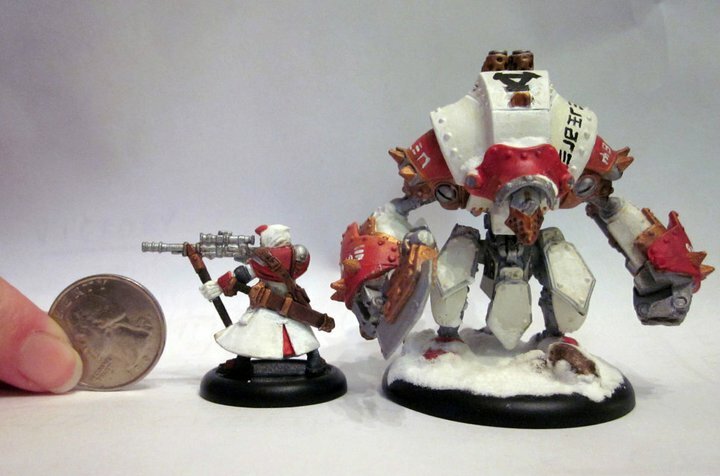 There are only two other Khador players, one a pButcher, the other Harkevich. I’ll take some pics and bring news of what goes down, although the real meat of this site won’t come until I receive this box (and all the other units I have ordered with it). So please just sit tight. Also, new look to the site. You like? Hey content is content. Yup, that is a quarter. Thanks to my lovely fiancee for being my hand model by the way. I know I was supposed to wait for the Slow Grow league to begin but I wanted to have at least one unit attempted before then (partly because I couldn’t wait to give it a try). Plus practice makes perfect right? And I am aiming to get a really nice looking force, not some standard 3 color playable mass. 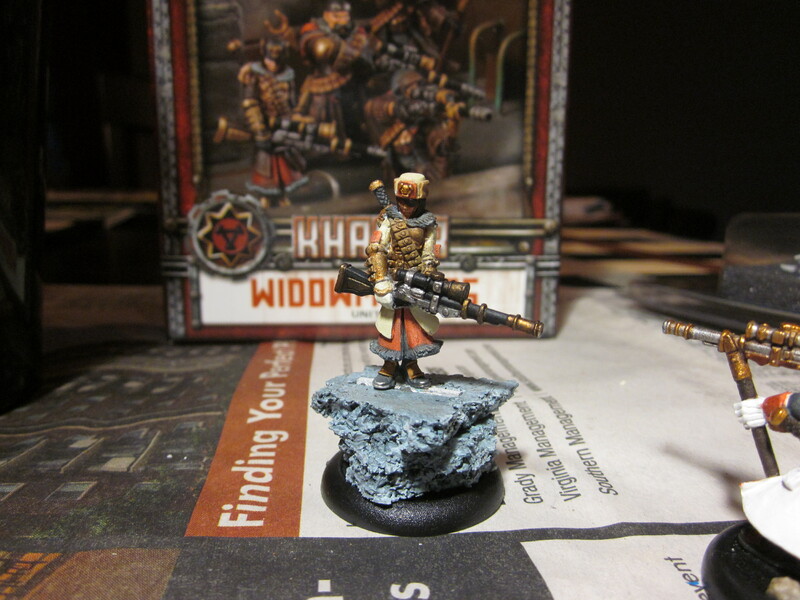 Well, on to the first unit, a Khador Widowmaker. “In WARMACHINE, the very earth shakes during fierce confrontations of Armageddon-like proportions. Six-ton constructs of tempered iron and steel slam into one another with the destructive force of a locomotive. Lead-spewing cannons chew through armor plating as easily as flesh. And a tempest of arcane magics sets the battlefield ablaze with such that the gods themselves fear to tread the tormented ground. 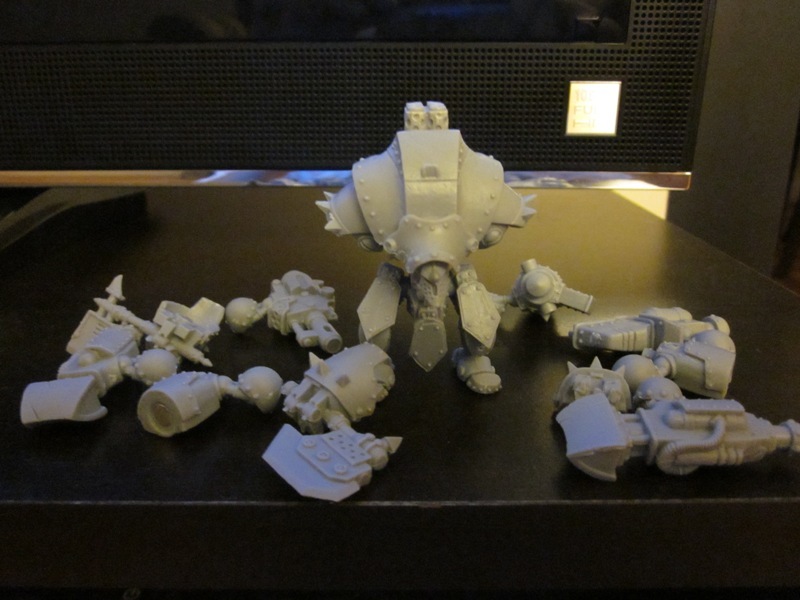 I guess I’ll should start with how I got into miniatures, and more specifically Warmachine. I am and not very new to the whole tabletop war-gaming scene. Let me explain what I mean. Video games and comics were always my nerd outlets. But I have had a fascination with the grim dark Warhammer 40K universe for a quite some time now. I would read the various wikis about it when I was bored, I’ve owned just about all of the Dawn of War games, even did a stint in Warhammer Online. But I never got into the tabletop game that inspired it all. I dunno, maybe it was the costs, or the fact I didn’t see them in stores that often. I happened upon a link concerning DC metro stores and events and I decide to chime in. Nothing big. Hi, I’m new. Never played, interested, blah blah…man, I was overwhelmed by the positive response. Invitations to google groups from players in the area flew in and the local Press Ganger, (forum name) Plarzoid, invited me down to Game Parlour in Chantilly for a demo game.